We are paper crafters at heart but also have a severe antique bug! Paper Crafting: Lisa and I started making paper crafts in January 2009 with the first one being our wedding reception party invitation. Lisa was very excited to finally find a sand castle die cut for our beach theme; it had only taken a few months to find it. We used all the normal sorts of card making material like vellum, vellum tape, a couple of sea shell stamps and real sand We created the invitations in the unfinished basement of our house in Dublin, Ohio. I remember Lisa saying something about "We could sell this stuff." No windows were in this dungeon - just unfinished cinder blocks, cement floor and all of our storage stuff (Christmas decorations, luggage, Easter eggs, etc). Lisa complained about the light. So I made her a window out of 11x17 paper and taped it up on the cinder blocks! She was amused - NOT! A few months later we moved the craft area up to a spare bedroom on the second floor of the house. She finally had her window. But it became quite apparent to Lisa that there was not enough room in the new "craft room". There wasn't enough storage, not enough table space, and the sink was in the bathroom (which was only 15 feet away). In July 2011, we had the opportunity to move up to the Cleveland area. Lisa was going back to the basement. But this time, I told her that we would build her a craft/design room. Now she doesn't complain about table/counter space, paper storage space, stamp space, windows (she has 2 half windows), or bad lighting. She even has a sink in the room! It's finished, but as I have learned from Lisa, nothing is done yet. The original stamp storage for wood mounts took to much space, so we remounted them in foam, put them in CD cases and Todd built new storage units for over 1500 CD's. One ink stamp rack wasn't enough, we need three. The ribbon storage needed more shelves. More shelves were needed for paper punches. Now finally, all is well - enough has been made and we have extra storage. Uh oh....Lisa just entered the room....she has that look on her face....she needs more storage somewhere! Help! In 2014, TLC expanded into vinyl applications and repurposing old windows and picture frames. In just a few months time, our vinyl has been literally flying out the windows!! So if you have old frames, old windows, or other old things that you need re-purposed, let us know because we can do it for you! If you just want to get rid of them...we will take them too! We are always looking for wood framed windows. Antiques: So when we moved into a local antique store to sell greeting cards, we got ourselves into seeing all sorts of antiques getting sold in the shop. Lisa had no prior experience with antiques, but soon got up to speed on what customers were looking for. 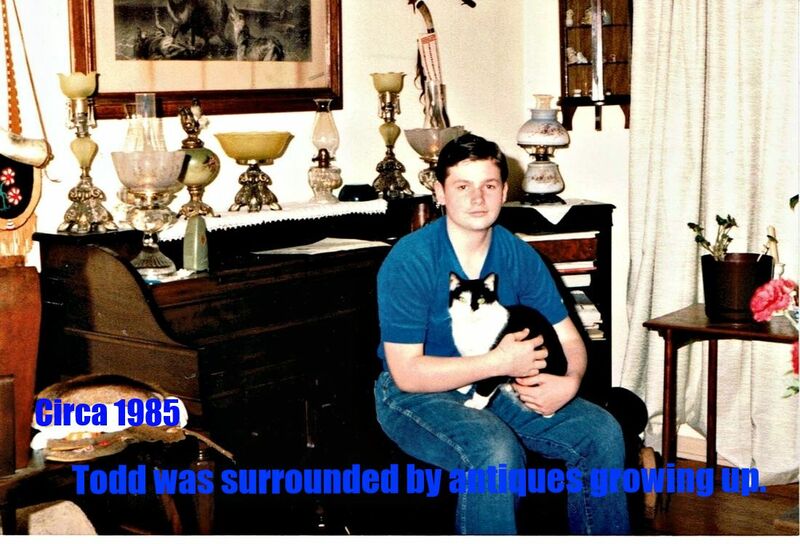 Todd had been around a massive amount of antiques growing up since his father was an avid collector and the entire house was decorated via antique furnishings. Todd and his father spent many Saturdays for years at estate auctions in the mornings and at the Seville Auction barn at night. Once Todd went to college, he stayed away from any antiques...for 25 years! Now, with working around antiques again...he's picked up the habit. Currently, we have no real preference of what kind of antiques we look for or like to collect - except we like to pick up only things our customers want to buy! So, for a few years we did antiques in a local shop, but the significant portion of our selling was online until we opened our store April 2016. His dad was involved in historical reenactments, particularly near the time of the French and Indian War period and prior (pre 1763). 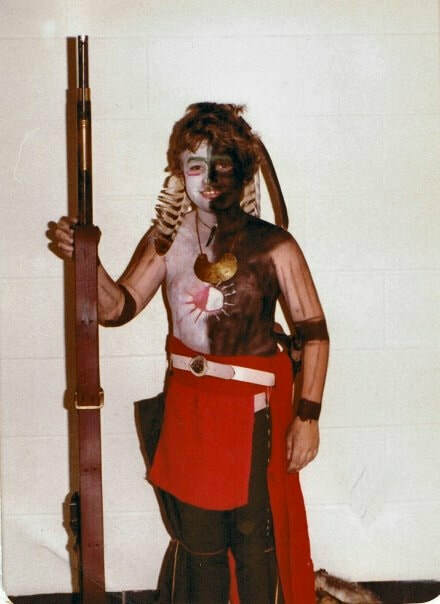 This 1979 picture was of Todd, dressed and painted in Shawnee Indian period attire (including an authentic loincloth and owl feathers). The flintlock musket was handmade by his father. As Todd got older, he also helped with making a few guns. During his childhood, he spent a great deal of the summer and winter months, camping and participating in long primitive reenactments including muzzleloading shooting.